Runners charged out of the gate at the start of the 4th annual Family Fitness Fun 5K and Expo, which was held Sunday, April 8, at the Burrage Mansion in Redlands. 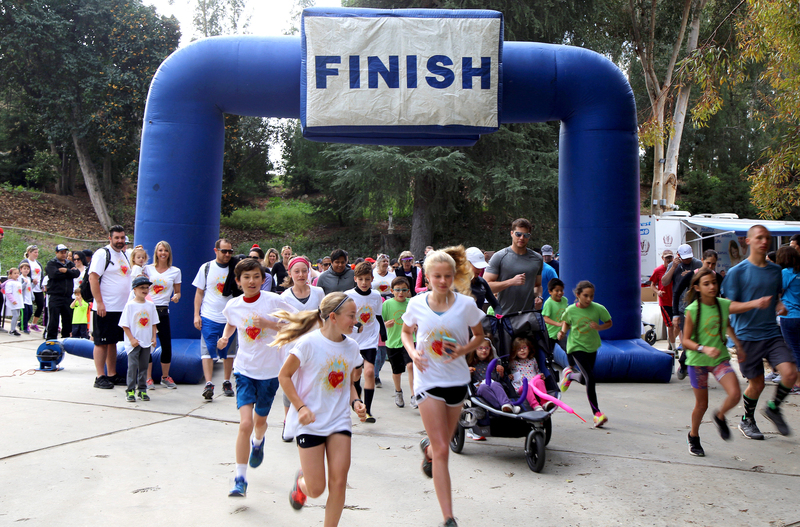 REDLANDS, CA — April 11, 2018 — More than 250 people turned out to help raise approximately $11,000 for patients aof Loma Linda University Children’s Hospital (LLUCH) during the 4th annual Family Fitness Fun 5K and Expo, which was held Sunday, April 8, at the Burrage Mansion in Redlands. Lynn Sleeth, president of the presenting Big Hearts for Little Hearts Loma Linda Guild, said gray skies did little to keep families, athletes, volunteers and community members from participating. The heart of the event is the 5K itself. Officials of the Redlands Police Department were on hand to organize the crowd of athletes at the top of the long Burrage Mansion driveway. The opening ceremonies consisted of brief remarks by Sleeth, Cheryl Slaton, event organizer, and Jillian Payne, executive director of the LLUCH Foundation, and a prayer offered by Scott Perryman, MBA, senior vice president and administrator of Children’s Hospital. Following the opening ceremonies, Chris Mead of the Redlands Police Department and the Dave Burton family, guests of honor, gave the command to start the race. In an instant, the runners/walkers were off, some charging out of the gate in a hurry, others moving at a more leisurely pace. Several parents pushed strollers down the driveway and out onto the course, which meandered through the streets of the quiet Redlands neighborhood surrounding the mansion. The first runner to cross the finish line was Loma Linda University School of Pharmacy student and Olympic marathon hopeful Joanna Reyes. Her winning time of 18 minutes, 20 seconds, was three minutes and 10 seconds faster than 15-year-old Evan Kusco, who finished second, crossing the line at 21 minutes, 30 seconds. Third place went to Lawrence Kusco, who completed the course in 24 minutes, 20 seconds. Jocelyn Martinez took fourth place, finishing 25 seconds later at 24 minutes, 45 seconds. Other popular activities included visiting the booths of several local vendors and community organizations, an obstacle course for kids, a golf putting and chipping clinic with a pro from Redlands Country Club, a tug-o-war tournament, the YMCA East Valley Circus, lawn games, crafts, a dental trailer sponsored by Loma Linda University School of Dentistry, a fire truck staffed by the Redlands Fire Department, and an interactive reptile display staffed by Loma Linda University Professor William K. Hayes, PhD. Children got to handle non-venomous snakes, but Hayes made the crowd move back when he fished a large Southern Pacific Rattlesnake out of a plastic bucket on the end of a snake hook. The docile reptile flicked the air with its tongue, which Hayes explained is how snakes smell. Planners and organizers said they were pleased with the event. "We were gratified to see so many members of our Inland Empire community turn out to support the event," Sleeth said. "We are already making plans for next year and look forward to using the funds raised at this event to benefit the patients of Loma Linda University Children's Hospital."